Joyalukkas Group has rapidly expanded its global footprint since its inception in 1987. It has over 10 million customers and employs a committed and dynamic team of over 6,000 personnel in the UK, UAE, Oman, Qatar, Bahrain, Kuwait, Saudi Arabia, India, Singapore and Malaysia. Joyalukkas has been hailed as the world’s favourite jeweller, not without reason. Its jewellery chain was conferred the ‘Retailer of the Year’ award in the Middle East. Joyalukkas has the distinction of being awarded the Dubai Quality Awards Certification and is the only jeweller to be awarded the ‘superbrand’ status in the UAE for four consecutive years, from 2010 to 2013. Joyalukkas’ business interests include Jewellery, Fashion & Silks – Jolly Silks, Luxury Air Charter – Joy Jets, Money Exchange – Joyalukkas Exchange, Malls – Mall of Joy, Electronics – Joyalukkas Digital and most recently Realty – Joyalukkas Lifestyle Developers. 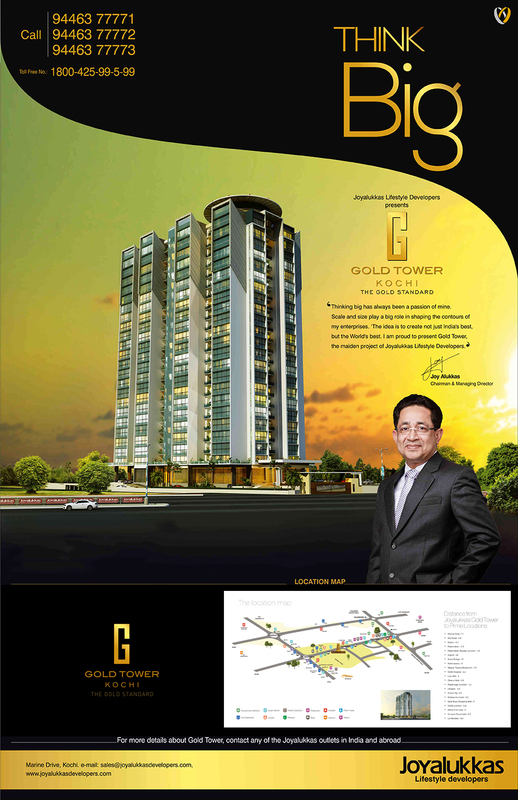 With his visionary thinking, Mr. Joy Alukkas plans to scale the real estate peak with this pilot project ‘Gold Tower’ – a high-rise that is all set to raise the bar in terms of construction, quality, design and style. Mr. Joy Alukkas’ vision is to make it ‘not just India’s best, but the world's best lifestyle apartment tower . 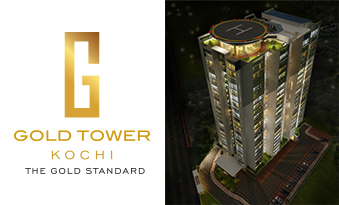 Gold Tower property will come up in Vazhakkala, the nerve-centre of expanding Kochi, at a prime location that is easily accessible and just a stone’s throw away from all conveniences. We consider professionalism a mark of integrity that characterises our every enterprise. We are professionals who have systems in place to ensure that our ‘customer is king’. We put your needs first, right from the day you trust us to make good on your investment and deliver the perfect home. We approach the entire home planning process with you as our partner. A unique approach, but one that is part and parcel of Joyalukkas Lifestyle Developers! Joyalukkas Lifestyle Developers Pvt. Ltd.
Marine Drive, Kochi - 682 031. © 2015 www.joyalukkasdevelopers.com All rights reserved.